Leading Chester Chartered Independent Financial Adviser, Innes Reid, has enhanced and strengthened its team with the appointment of three new members of staff, as part of its continued growth strategy and expansion for the coming year. 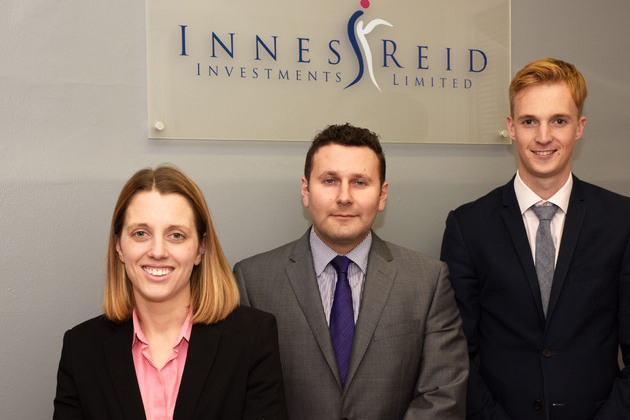 Innes Reid has consistently grown its business year-on-year, delivering growth in excess of 20% per annum, by providing personal independent financial planning advice, investment management, and business planning advice across all markets. First member of the new trio is Independent Financial Adviser Stephen Davies, who studied Economics at Liverpool John Moores University, graduating in 2006. From university he joined a graduate training programme and has been advising clients since 2008. He was awarded Chartered status in 2014 and became a Fellow of the Personal Finance Society in the same year. Para Planner, Georgia Perry, is a BA honours graduate of University College, London. Her career in finance began with three years at Central Trust in Watford, holding the roles of customer account manager, and business analyst, before joining the Cheshire Building Society for seven years, where she worked as a senior financial consultant. Ethan Smith is a trainee para planner, who studied Classics at Newcastle University. Since then, he has spent three years working at DWF Solicitors as a member of the Intelligence and Costs teams. A further sign of confidence comes in the company’s plan to embark on a major investment campaign in 2016, including an extension to their current head office in Hoole, and the launch of a brand new company website www.innesreid.co.uk.